More than words: The graphic recording of the conversation by the talented Jim Nuttle, and made possible by Allsteel and OEII. 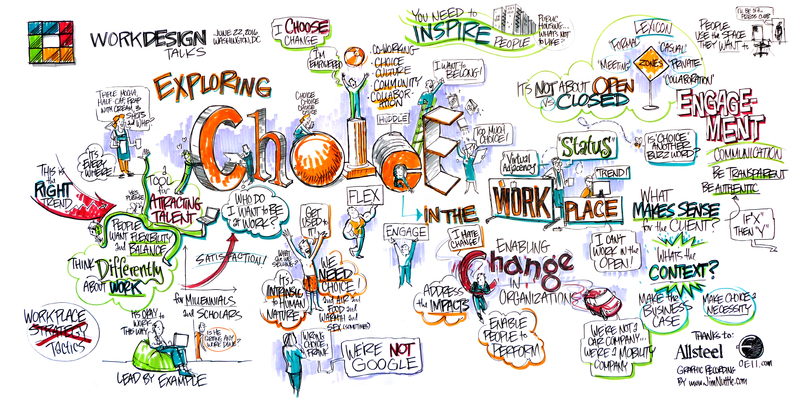 We brought our general “choice in the workplace” TALK theme back to D.C. last Wednesday night, but this time, we gave it a twist: we didn’t just talk about choice. Instead, we stacked the panel with designers only, and talked about designing for it. Cheryl Durst, the executive vice president and CEO of IIDA, the International Interior Design Association, joined us as guest moderator, and CallisonRTKL hosted us in their big, bright office, where early-arriving attendees got to tour the new Arcadis space upstairs. As if that weren’t enough excitement (or, dare I say, choice), our hosts, along with Kimball Office and FurnitureSpeak, sponsored another “TALKing Heads” video (check it out here), and, with support from Allsteel and OEII, we were able to have the talented Jim Nuttle along to capture the highlights of the conversation in a way uniquely his own (see above). Scroll for four key takeaways from the conversation. Meet the panelists, from left to right: Steve Polo of OPX, Stefana Scinta of CallisonRTKL, Marie Moutsos of FOX Architects, moderator Cheryl Durst of IIDA, and Arnold Levin of SmithGroupJJR. Photo by Erin Kelleher. This is where more of the right choices could help you attract and retain talent. Panelist Marie Moutsos, design director at FOX Architects, agreed that employees have come to expect a certain amount of flexibility and choice, indicating how glad she was to have had the choice earlier in the day to leave her desk and book a conference room to prepare for the panel discussion. Ultimately, once the choices have been decided upon and provided for, the panelists agreed that the success of the environment requires leadership to lead by example, showing staff that, hey, it’s ok to work this way. Nobody is going to shame you for not being at your desk, if you still have one. “Whether we give people choices or not, they’re still going to make them,” added Polo. And there are myriad wrong choices to make: not utilizing the spaces you’ve designed, using them but using them in the wrong way, or “voting with their feet”, a phrase we hear a lot, and choosing to work elsewhere if they don’t feel comfortable or able to take advantage of the new options. His point? Don’t let the same thing happen to choice. And ultimately, Durst said, that’s why choice won’t be just another trend. If you are interested in sponsoring another upcoming TALK like this one, please email michelle.weiss@workdesign.com for sponsorship details. We’d love to have you along!